The new casters from Shopsmith are one of my favorite all time upgrades. I pushed, pulled, and wrestled Mark Vs all over the country for 20 + years, over gravel, in and out of malls, hotels and fairgrounds. 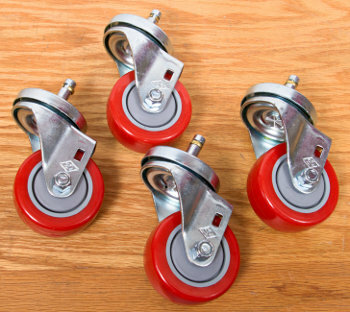 If these casters had been available then, I would have paid triple the price. Simply put: they make rolling the Mark V EASY! Shopsmith says, on their website and in ads, that you can push the Mark V/Mark 7 around with 1 finger…all true. The only difficulty I had was breaking loose the old nuts that held the old caster assembly in place…some WD40 a half hour earlier would have been a good idea. It took me about 30 minutes to install. Let me check on that for you, Terry. The difference is the miter bar. The one from Amazon has a wider and thicker bar made for standard table saws, not the Shopsmith worktable. The Amazon I-BOX will not work in the Shopsmith miter gauge slots. He must buy the Shopsmith I-BOX to use it on the any of the Shopsmith machines. ps; I have several finger joint jigs and all work OK; but from what i am hearing about this one from Incra, it looks like i will have to get one (oh, darn, another tool :)). Are you aware you can order through me and get 10% off your Shopsmith purchases? I’ve recently purchased an experienced Mark V & after placing it in my shop went through the setup & alignment. It only needed a few tweaks so it went pretty fast. My question is, after seeing the caster review & video, how concerned should I be about moving it around on the casters & working without realigning it? I’ve been under the impression that it would need to be gone over every time it got moved. In my experience, moving the Mark V around the shop should not require any re-alignment. If I have a super critical cut (most are) I will check for squareness, but this only takes a few seconds, and rarely is any alignment needed.If you were to drop a rip fence, miter gauge, etc. you would of course want to check and realign if needed. Bottom line: the Shopsmith holds alignments extremely well. I did the caster upgrade today and would like to offer a suggestion on a way to make it a bit easier. Glue the paper drilling templates to a piece of pasteboard or heavy posterboard (an old cereal box works well fo this). Then punch or carefully cut ou the 1/4″ alignment holes for the old screws and punch or prick a small hole where the new screw holes go. Cut out the templates and use the odd screws to attach them to the legs. Centerpunch through the small holes and drill small pilot holes through the templates. Remove the templates from the legs and enlarge the new holes to the specified 9/32″. Then procede as per the printed upgrade instructions. This makes getting the new holes aligned properly simple. I have found a problem for some time now with replacement red Shopsmith casters that I installed on my Shopsmith 520 upgrade. The problem I am having is that the foot peddle to raise and lower the Shopsmith keeps hanging on the round top plate of the new casters. I can get the first lift notch but the second and release notch hangs on the plate of the wheel. I contacted Shopsmith and the ladies were understanding and said I may have to cut a portion away to make room. Not sure exactly what portion they are talking about. Thought it was the top round plate of the caster but realized if I do that the ball bearings might pop out. Can the foot peddle be slid further away from the caster on the shaft or is it locked tight with a pin? I’m at a loss what to do and yes I followed the installation instructions to the letter using the template. The holes are exactly where the template indicates. Any ideas? Chuck, I will see what I can find out. Chuck: this from Shopsmith’s chief engineer. The star wheel on pre-Folkerth casters are positioned too close to the caster wheel to avoid interference. He can try to knock out the roll pin (but sometimes it does not have a through hole) move the star wheel, re-drill the pin hole by using the hole in the star wheel as a guide for size and position. Or he can grind off the side of the end of the star wheel that hits the wheel. OR… For a nominal fee, he can replace the star wheel and shaft assemblies with what we make today. I’ll check on the price and let you know tomorrow.